US, 2017, 108 minutes, Colour. John Corbett, Cara Buono, Myles Moore, Barry Corbin, Nelson Lee, Angela Fox, Gregory Alan Williams, David Keith. 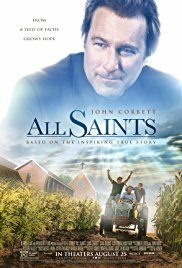 All Saints is an American faith-based film. It is designed as inspirational – and, in its pastoral outreach and social concern, it is. It is based on a true story, business and Michael Spurlock becoming an Episcopalian priest and his work in his first parish, the parish of All Sts, in Smyrna, Tennessee. Burdened with a heavy mortgage, the authorities have decided to close the parish, sell the church to a developer, sell all the goods within the church and rectory. Michael has to supervise everything for an almost immediate sale. John Corbett tends to be laid-back in so many of his performances (as in the Big Fat Greek Wedding films). Here he is a rather ordinary man who has failed in business and wants to succeed in ministry. He is strongly supported by his wife while his son, teenager, has accepted this mission far from New York City and his friends. The members of the parish are particularly hostile, some of the women with photo albums reminiscing about the past, and a crusty old man, Forest (Barry Corbin) who served in Vietnam and thinks that Michael is a huckster. You know he will come around – but it does take a long time, convincingly so. What changes the situation is the arrival of Burmese refugees, Karen, escaping from the Civil War but finding it difficult to settle into American society and to speak the language. Their leader, Nelson Lee as Le Win, becomes friendly with Michael, explaining that Burma was colonised by the British and that they were brought up as Anglicans. Michael and the family collaborate with the Karen people who become part of the congregation, work hard in chicken factories. During rain, Michael gets an inspiration hearing it as the voice of God, that he should stay, work the property around the church as a farm, market the vegetables, pay off the debt. He is allowed a temporary reprieve by the church authorities and there are months of sowing, watering, finding extra equipment, the parishioners coming round, the Karen working hard. But, with all this hard work and dedication, rain scarce but, as they prepare to harvest, there is a and much of the crops destroyed. Just as Michael is prepared to go back to his previous job, the Bishop announces that there is another reprieve, that All Saints will become a missionary church and supported financially as such, a job for Le Win as a lay assistant. Michael Spurlock and his family are appointed to parish in New York City. At the final credits, there are photos of the real characters and explanations of what it happened and the explanation that what God had created was a strong community. 1. An American faith film? Impact for Americans, Christians, non-Christians? Worldwide audiences? 2. Based on a true story, Michael Spurlock and his family, the church of All Saints and its community? 3. The Tennessee settings, the town, the film made on location at the church itself and its grounds? The surrounding countryside? The musical score? Hymns? 4. The film as inspiring? For human hope and endeavour? For following the gospel injunctions, especially towards strangers, refugees? 5. The opening, Michael Spurlock being appointed to the parish, the presence of the Bishop, Michael making a promise to obey whatever the circumstances? His being strong minded, his previous job selling paper, his wanting to do good? The support of Aimee? The difficulties for Atticus and his being away from New York friends? The small community, the general hostility? Michael being commissioned to make an assessment of the church and the property, to raise money for the mortgage? Selling off the possessions of the church? 6. The Karen from Burma? The refugee status, civil war in Burma, persecution of the people? In the United States? Difficulties in language, customs, farmers coming to the US? Le Win as the spokesperson, at the welfare centre, the difficulties for getting food? Local jobs? Crowded houses? The children? 7. Le Win coming to the church? The encounter with Michael? The need for food? The group coming to the rectory? The group coming to the church? The reaction of the locals? 8. The challenge to Michael, business or the gospel? The pressures from the Bishop? Michael and the rain, thinking he had heard the voice of God, discussions with Aimee, his decision to stay? 9. The possibilities, the ground, growing vegetables, farming, his wife’s caution about it being an ego trip for him? The reactions of his son? The decision to go to the Bishop, to the board, taking Le Win with him? The presentation of ideas, the board and the business focus? Le Win and his plea, timeout, the discussion, given to Thanksgiving for achievement? 10. Aimee, her wanting to do something with music, with the children, the singing, laughing at her pronunciation? The three boys in school, kickboxing, having to be in the program, unwilling in the choir? Their joining in? 11. The locals, gradually mellowing? Contributing machinery, volunteering for work? For food for those working on the field? 12. Forest, cranky, Vietnam experience, calling Michael a huckster, continually challenged him? The memories of the church? His visit to Le Win, their talk about weapons, war and the jungle, his being given food, his later visits, at home with the Burmese? 13. The expenditure, the seeds, the equipment? The credit card? His wife buying the guitars for the choir? Trust in Providence? The help with watering the seeds, needing something bigger, the day off and picnic and the offer of the bigger sprinkler? The possibility of a tractor, bargaining, raising the loan to buy the tractor? Watering the seed? 14. The Burmese, working in the chicken factory, volunteering in the fields? Hard work? The need for water? In time for Thanksgiving? The rain coming, the heavy rain, the sand bags, the ruining of much of the crop? Salvaging what was possible? Going to the farmers’ market, the truck impounded and the crop inside ruined? 15. Michael, checking the possibilities of returning to his work, sense of failure? Asking about God? The questions about God and the rain from Atticus? 16. The Bishop, acknowledging all that they had done, bringing the message of the missionary Council, All Saints as a missionary church, supported, salary, Le Win being paid as a lay assistant? 17. The Bishop, his work in Africa, the story about building a church when the people wanted an aqueduct? His making way, going back to Africa? The appointment of Michael to a prominent parish in New York City? 18. Atticus asking his father about what it happened, Michael replying that things would happen with God’s help – and Atticus replying that Michael himself was God’s help? 19. The aftermath, the photos, the information about the church, the community, Michael and his work? 20. The picture of an Episcopalian pastoral ministry, outreach to the persecuted and the refugees, refugees becoming part of the American community?